As an Assistive Technology Specialist, working with people who have a wide variety of disabilities, I have used many of the Augmentative and Alternative Communication applications that are available for the iPad. HandySpeech will work for anyone who can write or type. The handwriting recognition is great. The overall design is easy to use. This app is very reasonably priced. Also, I work in an area where English is not necessarily our client’s first language. While this app will not work for those who need picture based AAC, it will work for those who are in communities that do not speak English. "We have been putting HandySpeech through its paces this morning. We are both absolutely amazed!!! Your app really can make an important contribution to quality of life for people who have difficulty speaking. it didn't exist. Thanks to you, it exists now! I really can't tell you how much this means to me personally, and I know others will feel the same way once they discover your app. What you have done is beyond expectation!" this app will be an amazing opportunity to so many!Sounds like a winner for so many! Pass this one on for the young entrepreneur and those he will free!" for people with speech difficulties." 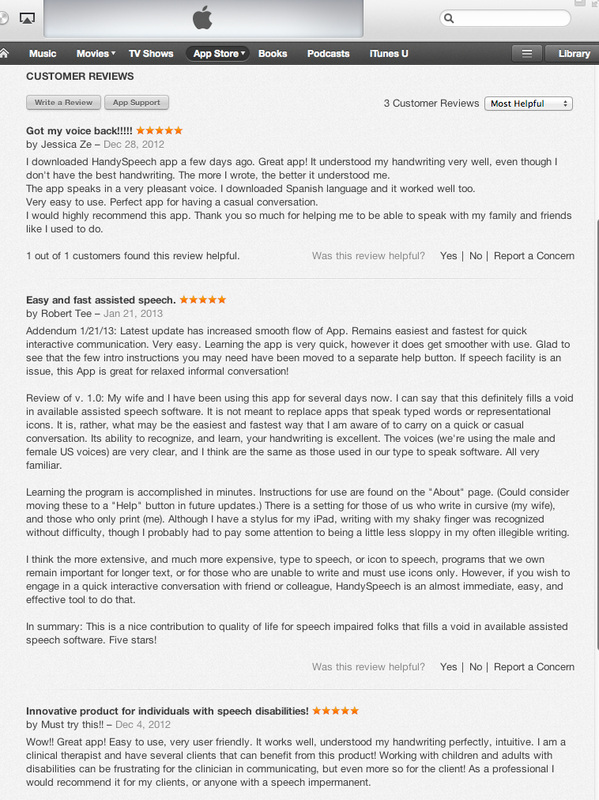 "Thank your for coming up with a speech app for those who have verbal disabilities. It is hard for some people to speak and be understood. It is frustrating to them and also for the person listening. This app will help so many who have struggled throughout their lives to be heard. to quality of life for those with speech difficulties."